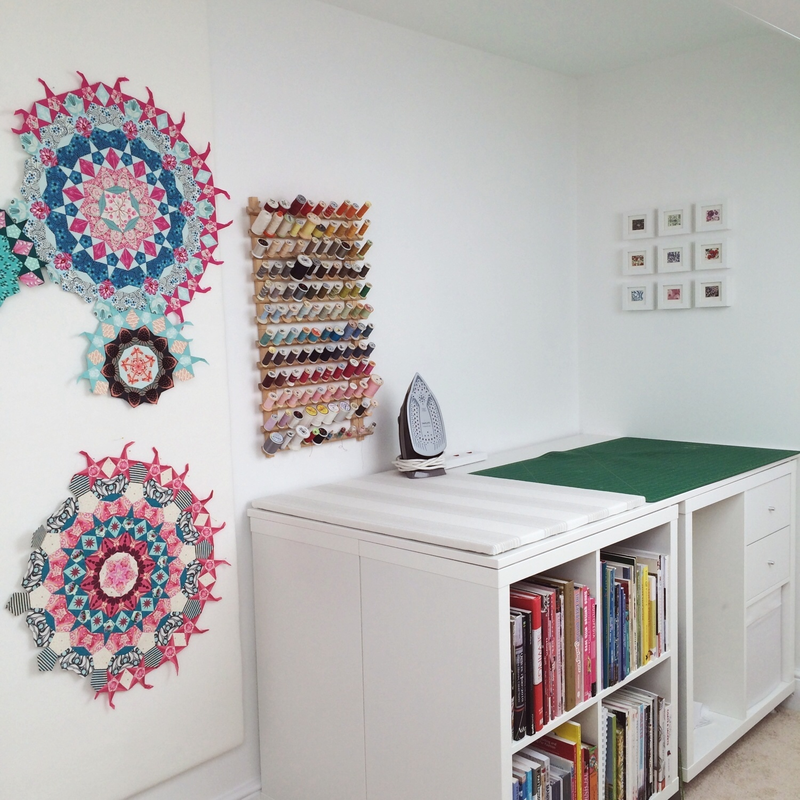 Finally, some photos of my sewing room! I can only put the delay down to an initial flurry of it feeling more urgent to use it than it was to photograph it! I've always loved seeing how people set up their work spaces, whether it's a huge studio or a corner of a dining room, so this is a very photo-heavy post with all the tiny details included! 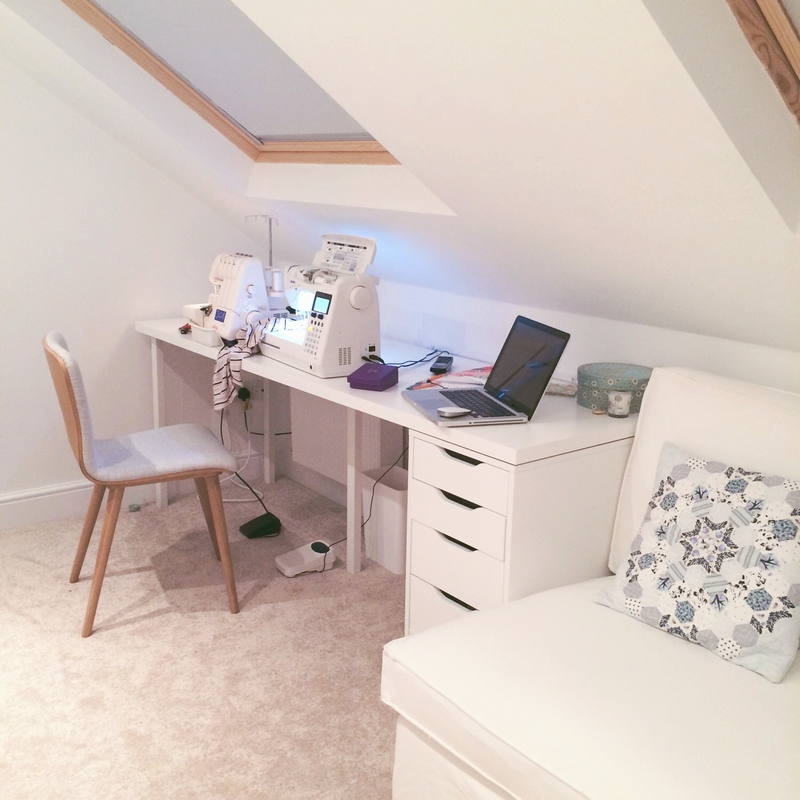 If you're also interested in seeing how I made a multi-tasking room work for me, you can read about it in this post as, until a few weeks ago, I've spent the last eight years sewing in our bedroom. 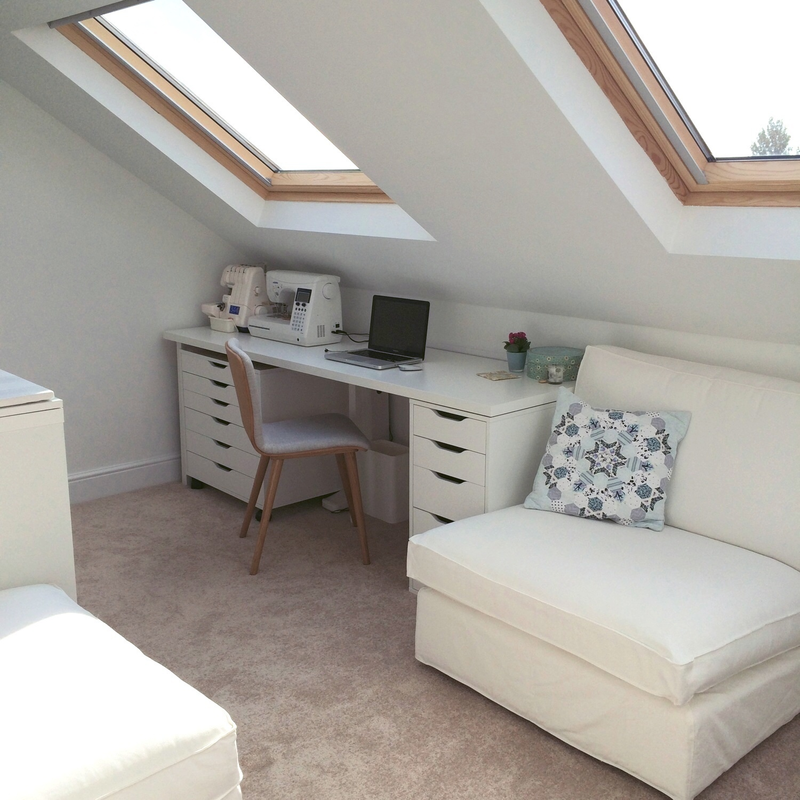 At the outset, I should say that everything apart from my desk chair is from Ikea, as it's relatively inexpensive, they do a huge range of white furniture (which is what I wanted) and it's flat-pack, which meant we could get it up the stairs easily. I've had Ikea furniture in the past and developed an allergy to the fibre particle-board (which sits inside the white outer casing), when it became exposed when I broke part of it during construction! 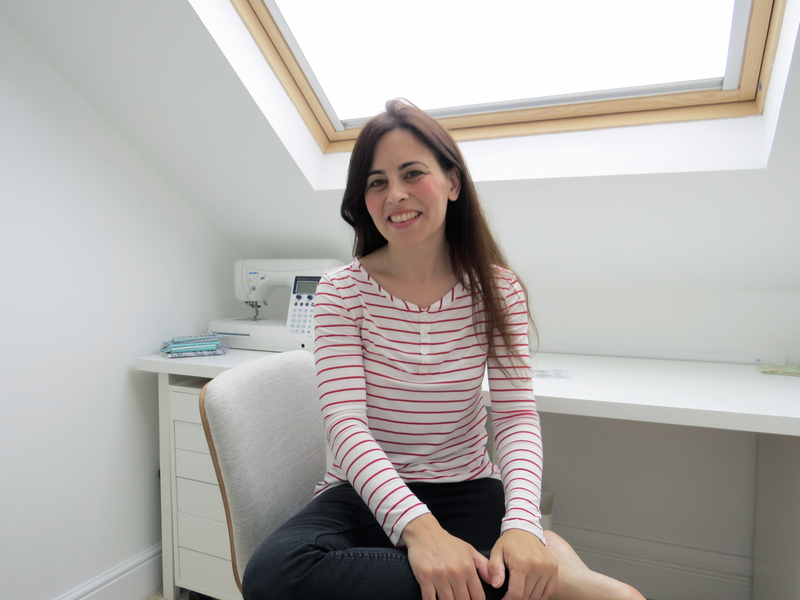 This time, I decided to go down the allergy prevention route of asking someone more adept than me to construct it - that is a winning solution in so many ways! Above, shows a bit of my design wall with some Passacaglia cogs in progress, the making of which I blogged about in more detail here. It also shows my cutting table. I spent much of the time that our loft was being converted agonising over how big the cutting table should be. It's not a big room, but in the end I decided to go for something that was a super-sized beast of a table, on the grounds that often sewing projects take just as long to cut as they do to sew. I also knew that I didn't want an ironing board in the room. I'm terribly accident prone and have lost several irons when I've knocked them onto the floor. 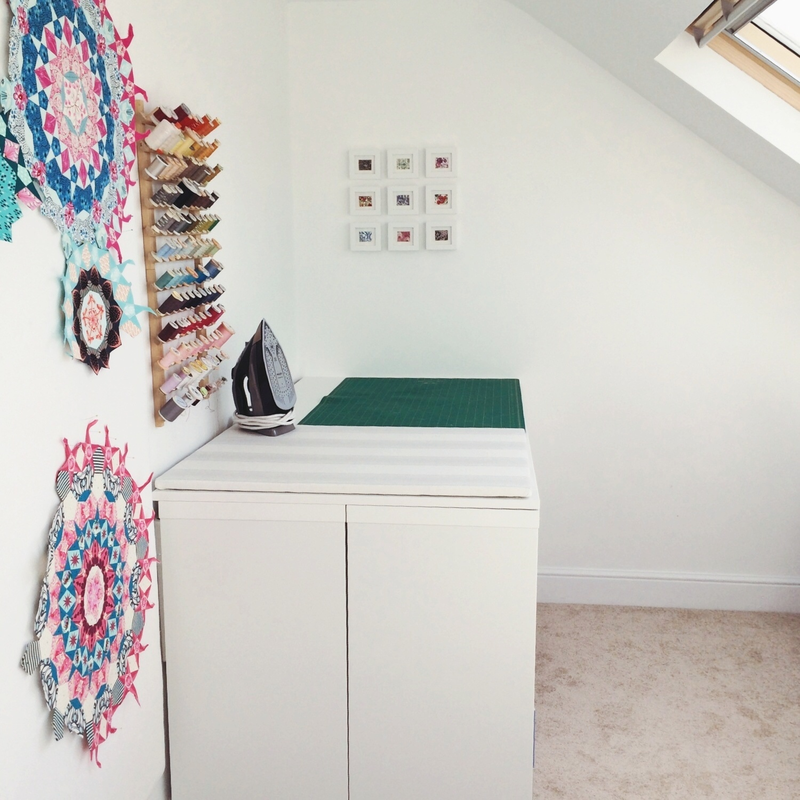 I've also spent the last eight years alerting my children to the iron whenever they've walked into the room - so I wanted the cutting table to be large enough to also house a pressing pad, so that we'd all be safe, including the iron! 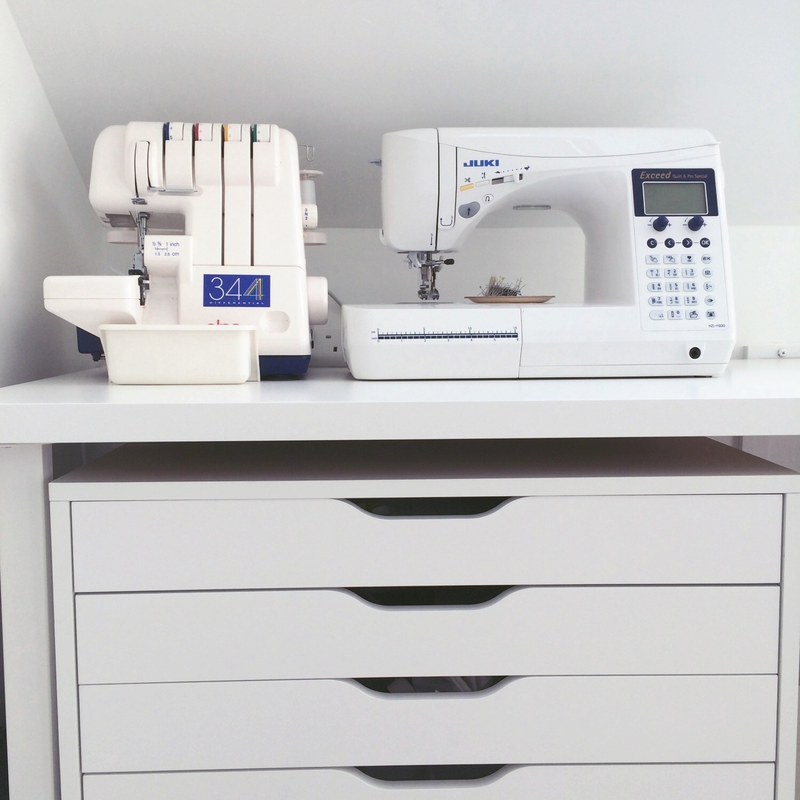 The cutting table is made up from four Ikea Kallax units, with a huge white desk top (also from Ikea) placed on top. I've used sticky-back velcro to keep the table top in place as I didn't want to drill it onto the units. The cutting table has a huge amount of storage under it. I've kept the most frequently used things in the more easily accessible storage boxes and the rarely used items sit in pull-out boxes behind the books. I've left a gap in between the two sets of Kallax units, where cutting mats and perspex grid rulers are stored for easy access. At my father's suggestion (always surprisingly practical! ), I chose to omit one of the shelves to make space for my knees, so that I can stand comfortably when I'm cutting. There are small pre-drilled holes exposed by doing this, but they're easily covered with little white sticky labels. 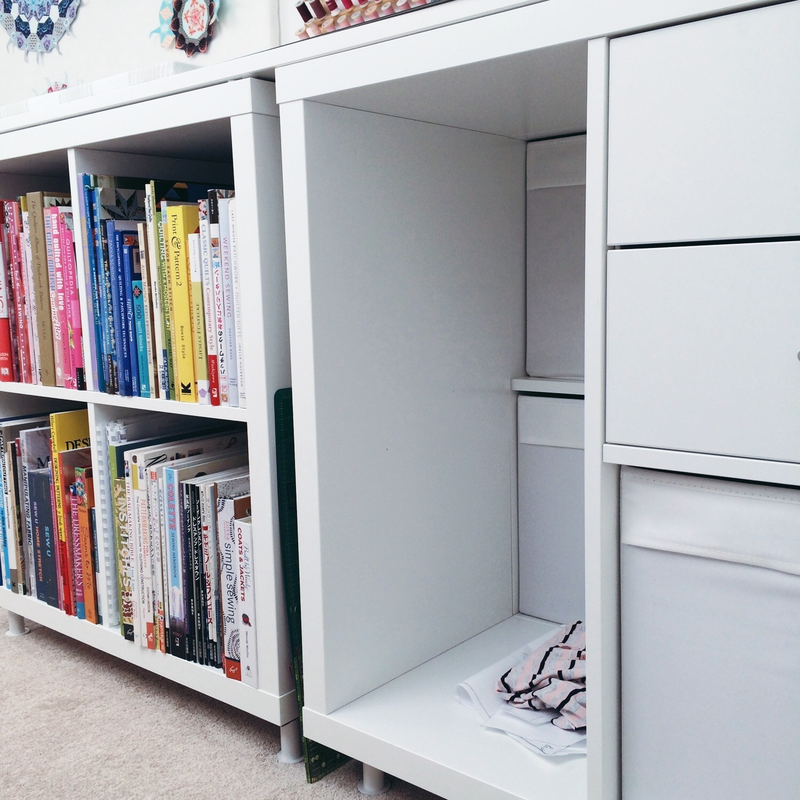 I also wanted to raise the whole thing up to make it the right height for me to cut at, and also to leave room for my feet to tuck under the units, so there are legs attached to each of the Kallax units. The cutting table is about 33"/86cm tall by the time the top and legs have been added - it's perfect for my height and I've already spent many happy hours cutting there without backache - that feels like a huge luxury. I keep my work-in-progress items stored in the open part of the unit…the coral and navy stripes are a jersey top that I've nearly finished. I made the pressing pad from a large piece of wood, cut to size at the DIY shop. I then covered it in a thin layer of cotton and a layer of linen. I read quite a lot about making ironing pads before I did it and what I discovered I found really interesting. Have you ever had that thing where you make a quilt block perfectly and then you press it and it suddenly looks slightly distorted? Apparently, it's because regular ironing board covers have too much padding and 'give' in them, which can lead to the fabric distorting slightly. When I first pressed something on this board I could instantly feel the difference and understand why this would hold true. I have no idea why, but one of the things that's always really bothered me when I'm sewing is having to bend down and turn the iron on and off constantly in between stitching seams, as it feels like a task that disrupts work flow (and may in part be the reason for my knocking the iron on the floor so frequently). So I planned out my space around this. 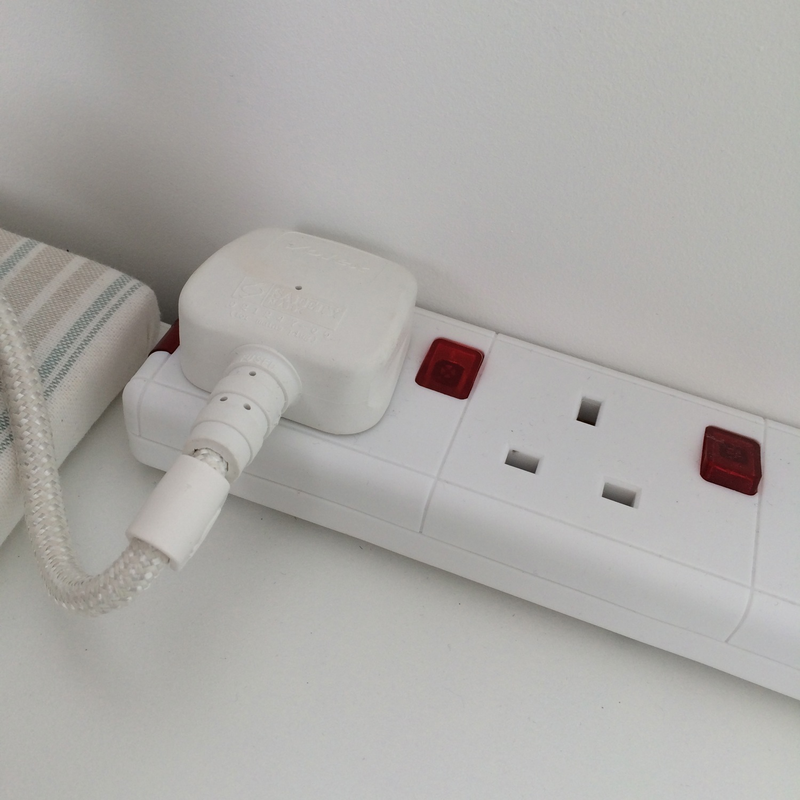 There's an extension lead that comes up behind the cutting table and sits on top of it. As each switch can be controlled individually it means that I can just flick the switch on and off without having to unplug it and it's right next to my pressing pad. It's such a small thing, but it makes me disproportionately happy! 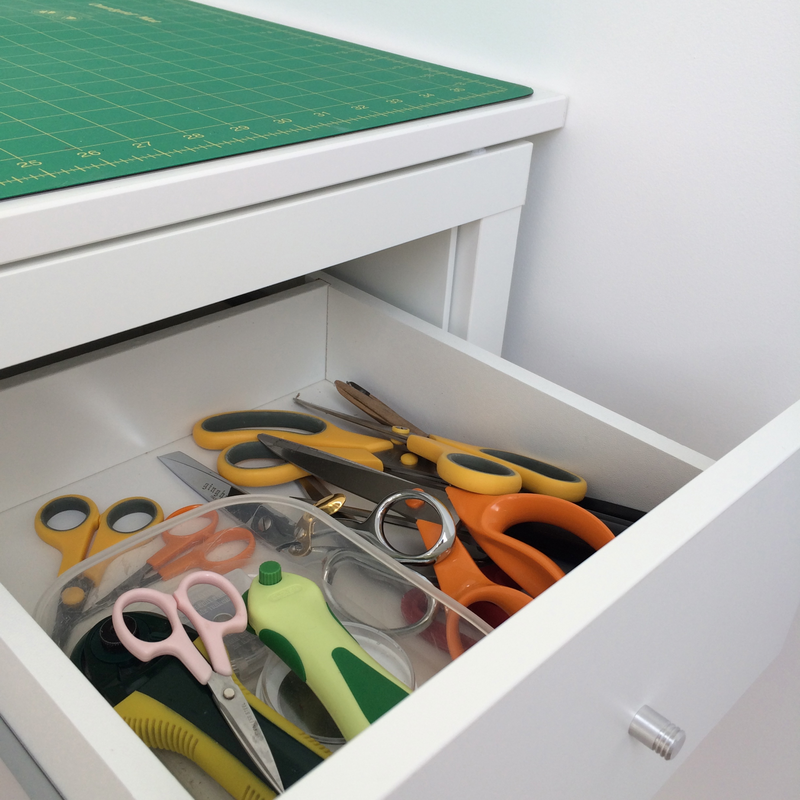 My rotary cutters and scissors are all stored right below the cutting table in the little drawer unit I've put inside one of the Kallax cubbies. 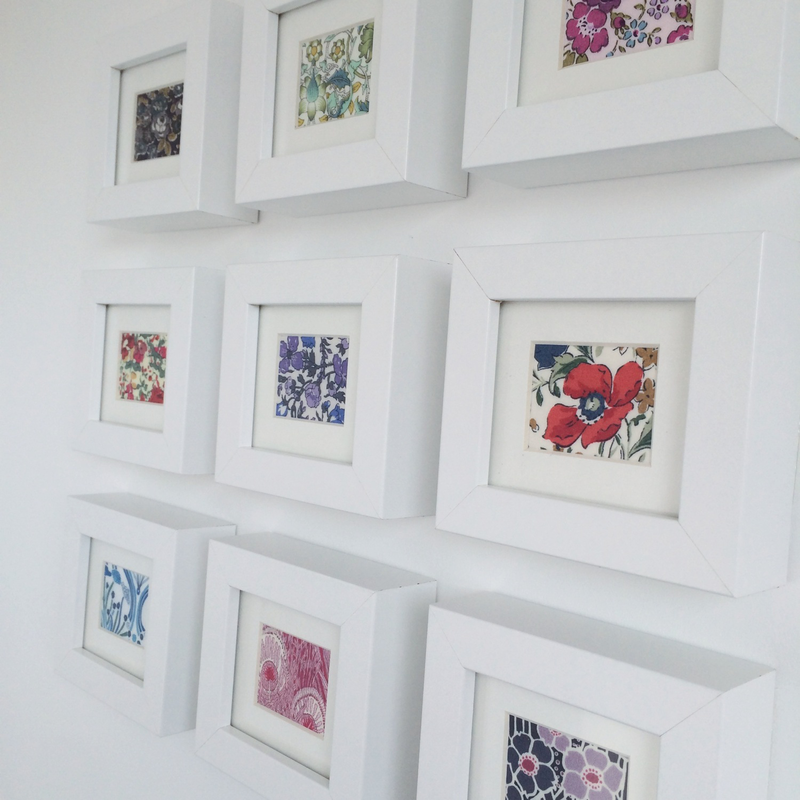 Finally, above the cutting table are the tiny framed Liberty Tana lawn swatches, which I posted about here. On the other side of my room is my sewing desk. I wanted this to be fairly long for several reasons: I wanted to be able to leave my sewing machines out (although most of the time, I actually store the overlocker in one of the cubby boxes under the cutting table - it's just out in these photos as I've been using it this week); my sewing room also needs to double as my office for when I'm working on the app business that I run with my husband, so I need space to have my laptop and all the paraphernalia that entails spread out; my daughter had said she'd quite like me to have a desk where she could use my second sewing machine and sew alongside me if she felt like it (we haven't done this yet, but it's nice to know we could if we wanted to). I wanted to pack in as much storage as possible, so I've got two different types of Alex drawer units beneath the desk, but one of them is on castors, so that I can move it easily if I want more leg space to flit between two sewing machines. 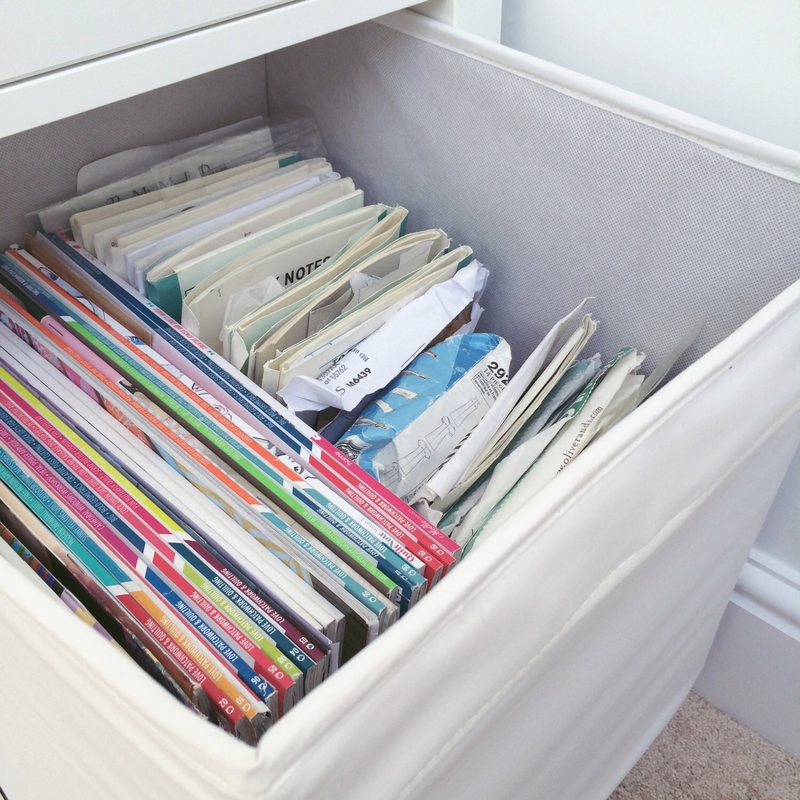 The photo above shows the desk when the larger set of drawers has been wheeled out of the way to make more space for sewing one evening last week! 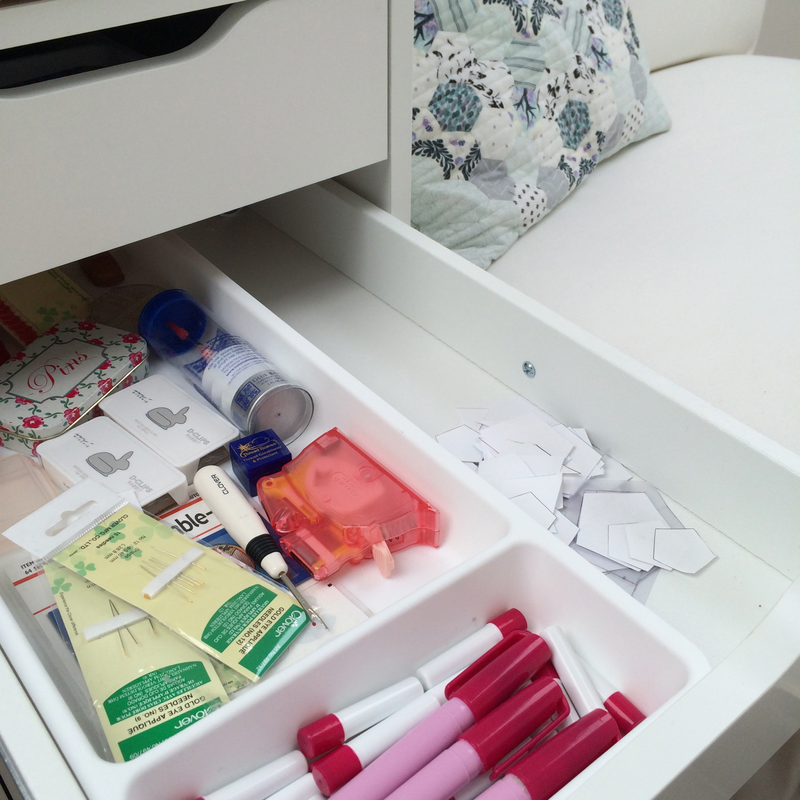 I only tend to store work things in that unit, so all my sewing paraphernalia is still to hand in the right-hand drawers. The other thing that I really wanted in the room was something that would be a really comfy place to do some hand stitching; a tempting place to lure my husband upstairs to chat to me during the day; somewhere for the children to lounge around while I'm sewing; and perhaps most importantly, somewhere for my mother-in-law to sleep when she comes to visit; and something that offered flexibility in terms of how much space it took up depending on what I was using the room for. We put a huge amount of thought into this bit and we even went to Ikea for the first time in over a decade to test out the options for comfort! In the end we chose the one-seat section of the Kivik sofa and a footstool to go with it (for reference, it is a much firmer seat than the chaise longue from the same range, which felt too squashy to sleep on). 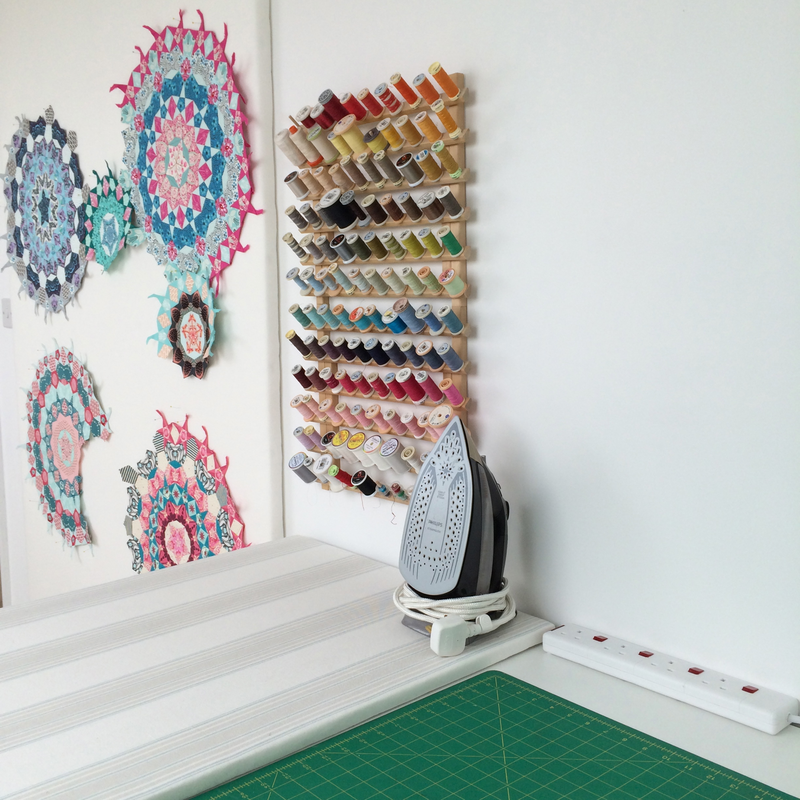 This means that if I want to baste a quilt on the floor, I can move the footstool to the other side of the room, but the rest of the time, it stays where it is, as in the photo below. When my mother-in-law visits we add another footstool to this and then cover the whole thing in an obscenely well-padded mattress cover that somehow fits and makes the whole thing feel really quite lovely. She told me it was really comfortable and luckily she doesn't mind being surrounded by sewing paraphernalia as she's an obsessive quilter herself. Above with footstool. Below, with footstool moved aside to make a bigger floor space. 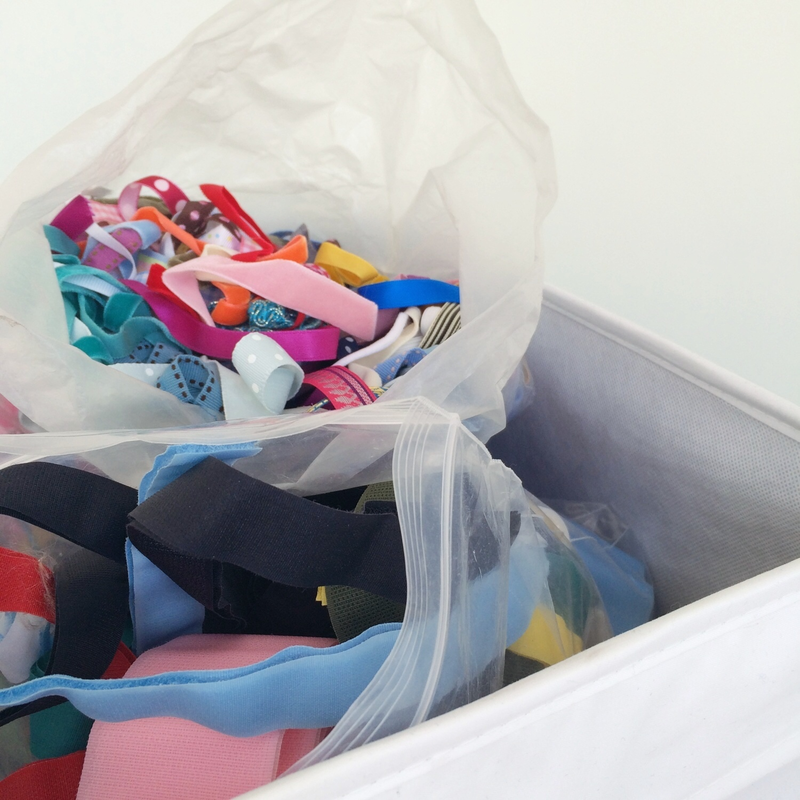 The chest of drawers as I come into the room holds all my fabric. 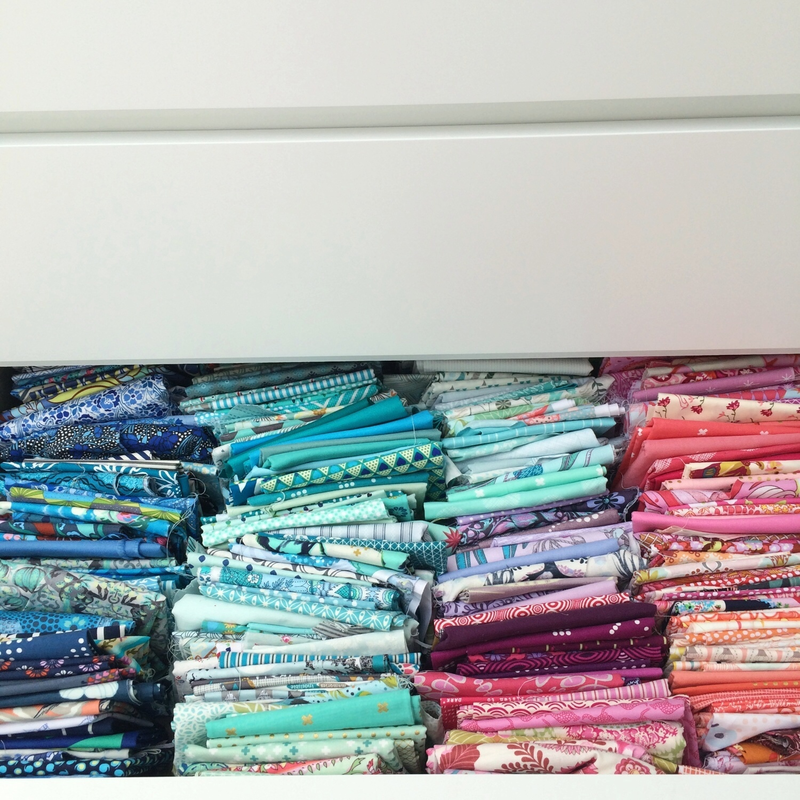 The bottom two drawers have all my quilting fabrics inside. 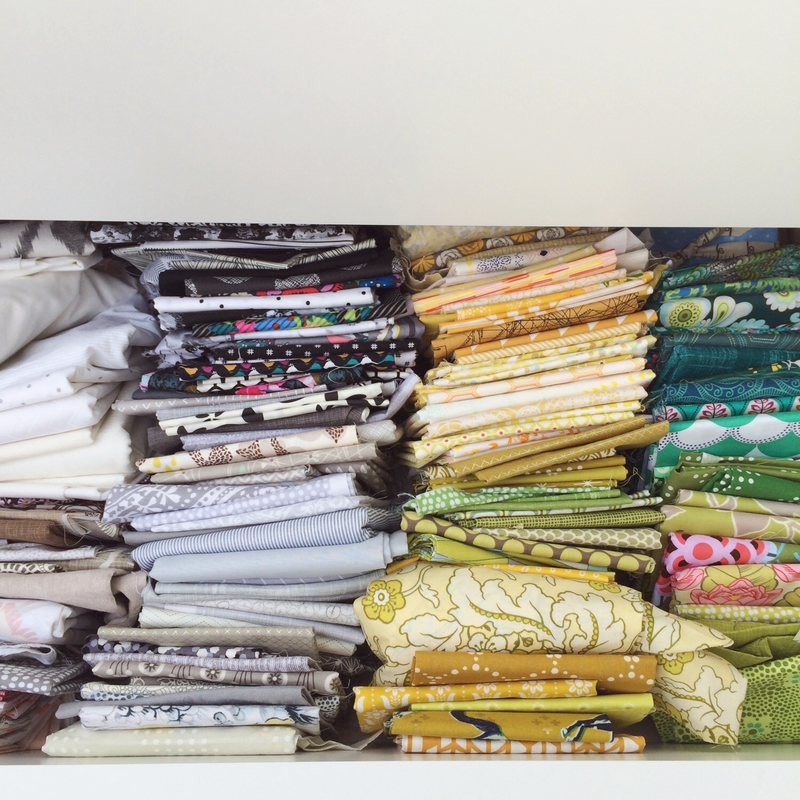 I've sorted the fabrics into rough colour order as I find it easiest to work that way. On top of the chest of drawers are some treasures: favourite books, most given to me by my parents (spines rapidly fading, so perhaps it's not the best place for them); the lego sewing machine my husband and children gave to me nearly five years ago; printing blocks from sister showing an old Singer sewing machine, along with mine and my husband's initials; a special teacup and saucer (a gift bought with money from my father); a terrarium made by daughter the summer before last; a framed segment of the patchwork Liberty dog bed that I made for Nell. 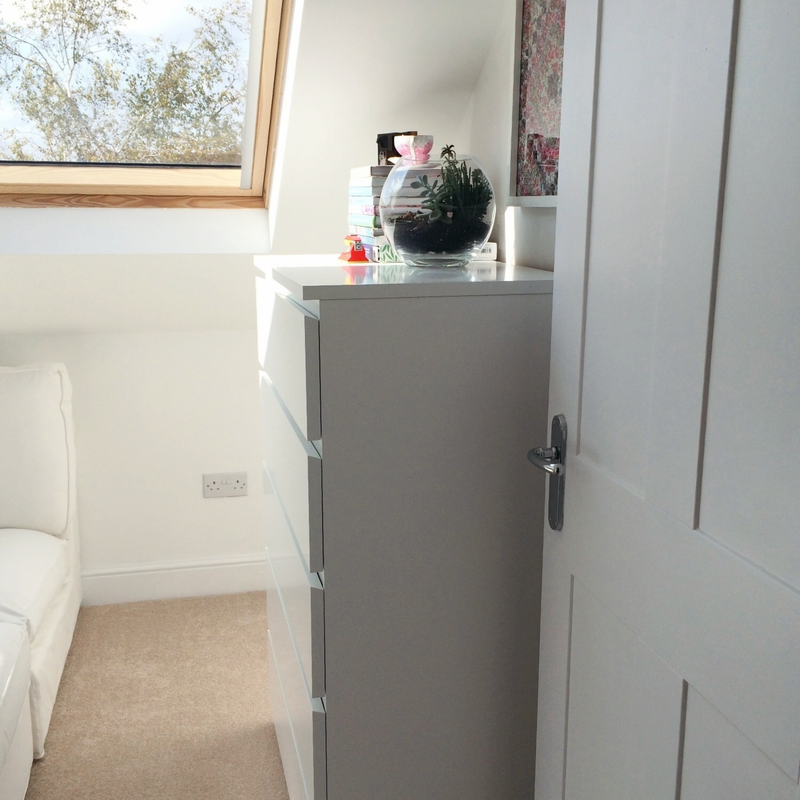 There's also quite a big, but oddly sized cupboard built into the corner of the room to the left of the drawers. I'd quite like to store a vacuum cleaner in there at some point when funds allow the buying of a second one, as it suddenly feels that the one in the utility room two floors down is a very long way away. Finally, here's the room in action. The thing that I appreciate most of all perhaps, is not having to tidy up a mess like the one below before I can go to bed at night…but also how much more quickly it can all be cleared away when I do tidy it all up. As you can see though, a cutting table can never actually be too big! Sorry for the extreme photo overload - it's rare for photos to outweigh words on my blog, but I think I've actually managed it here! I hope you enjoyed it though. 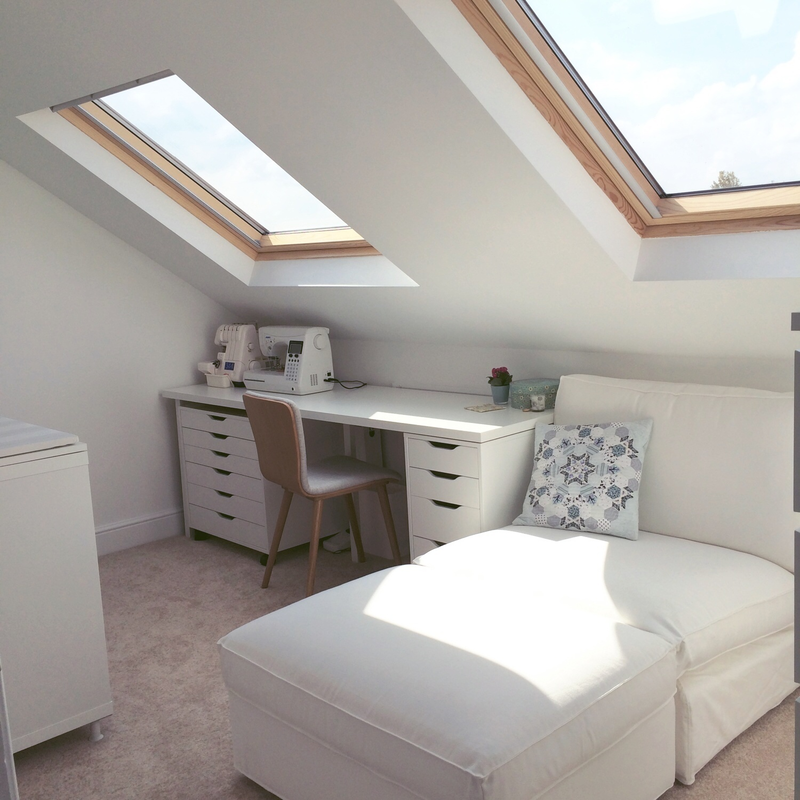 I feel like I've spent eight years designing and planning this room in my head and even when it was being built (just five weeks from start to finish! 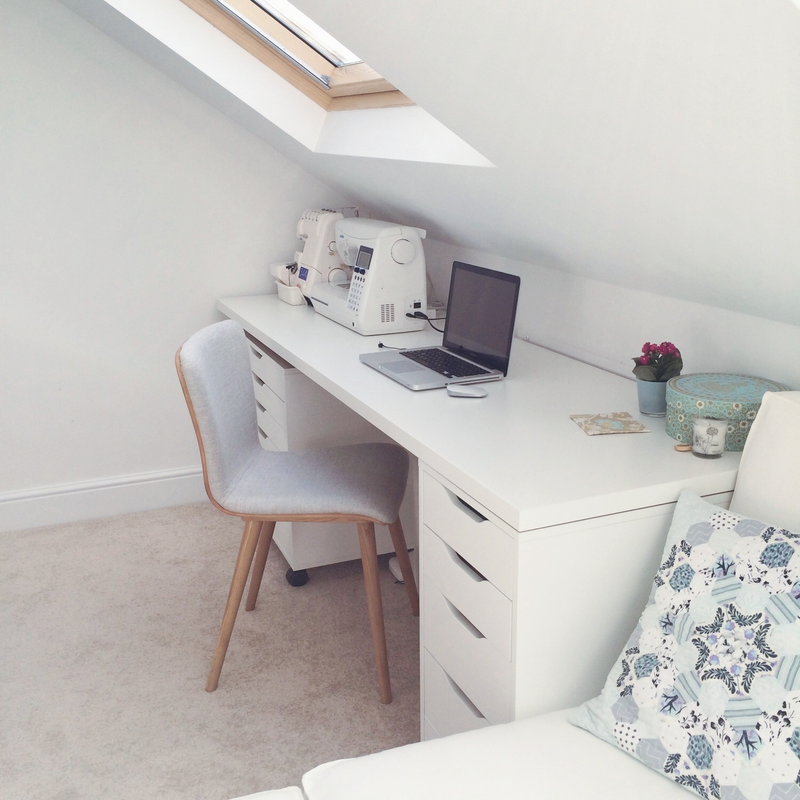 ), I couldn't actually believe that one day it would be finished and that I'd really have a sewing room of my own - it feels slightly unreal. 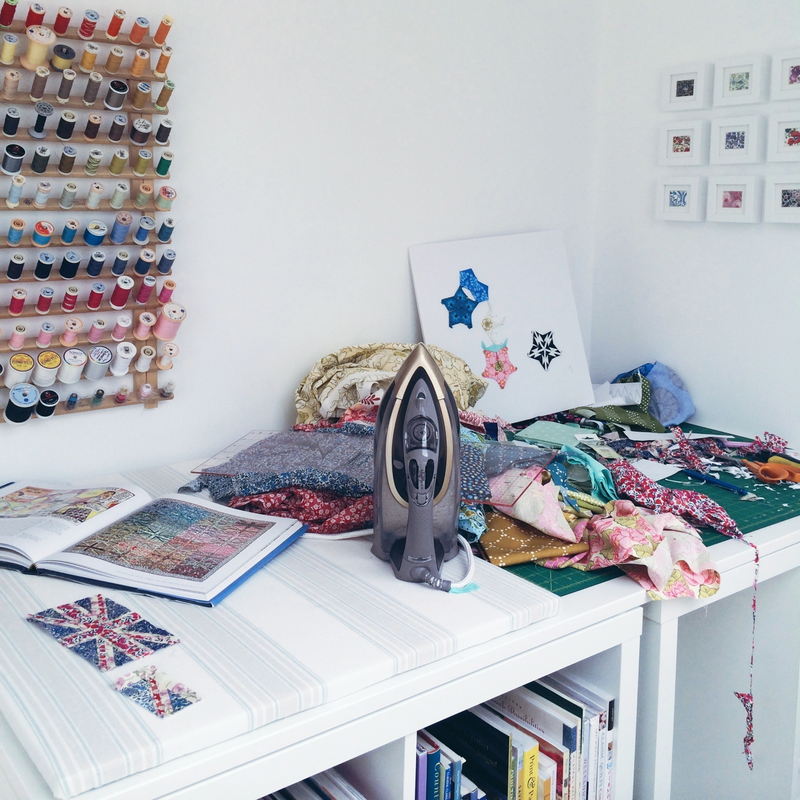 My favourite thing about the whole room isn't really anything to do with sewing at all though - it's the light. I'm now wishing we could balance all the rooms of our house on the roof so that every room could have skylight windows in it - they offer dramatic sunsets that must have always been there, but that I've been missing; the racket of pounding rain; and a feeling of complete privacy and not being overlooked. It's been a very, very long time since I've made a piece of clothing that I'm completely delighted with. So long in fact, that I'd almost decided that it may just be safer to stick to quilts, which always fit just right and never pull under the arm or unexpectedly transform me into a blancmange the moment I come into contact with it. So this particular spate of dressmaking was entered into with low expectations. If I'd have picked out a label to sew into this top it wouldn't say 'Made by Florence', it would say 'Made by Eeyore'. My last unfortunate make a few months ago never actually made it onto my blog: it involved a pattern which seemingly looks amazing on everyone else in the entire world, some utterly delicious Atelier Brunette fabric and a huge dollop of optimism at the outset, but I was left with something that was just wrong in every single way. As part of an extensive mental post-mortem of the 'wrong' top, I realised that although I often wear blouses in summer, most of the time I really enjoy wearing things made from knit fabrics which just feel incredibly wearable and lovely. 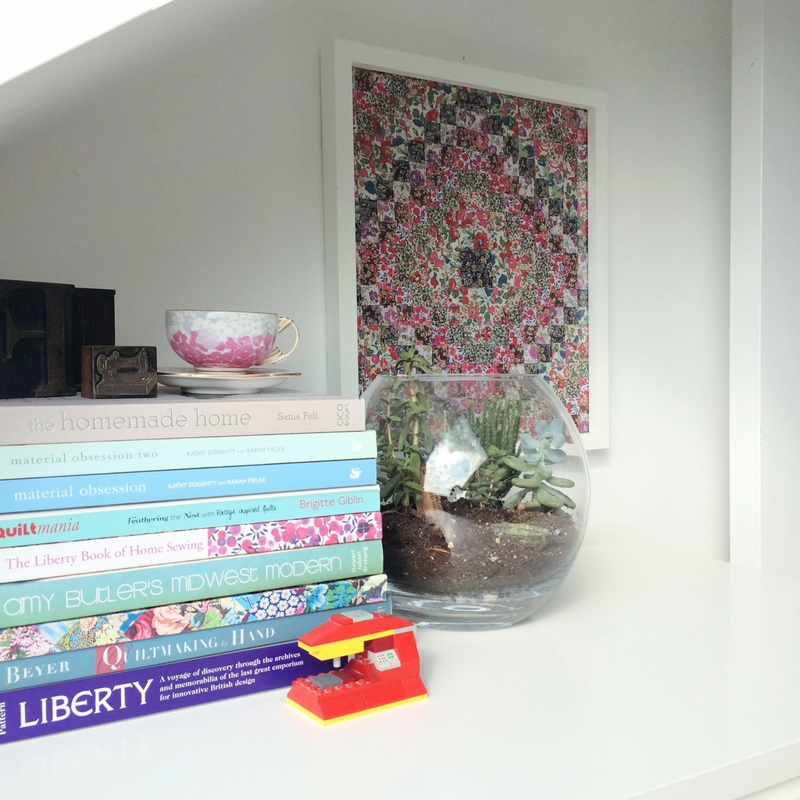 I wrote this post all about lovely knit fabrics and the Colette Patterns book about sewing with knits and then went back to some English paper piecing and ignored the lovely knit fabrics because I had had enough of sewing ugly clothing for the time being. But then when I took my daughter to an art lesson in town last week, I happened to see some delicious drapey striped fabric in my local sewing shop and found myself buying it and telling myself that it was time to try to make some ugly knit clothing, instead of ugly cotton clothing and that maybe it would be less ugly than the ugly thing which had gone before it. In my dressmaking history, the things that fit me the best are also those that I've drafted the pattern for myself, so I decided that for the preservation of sanity, I should go down that route this time. 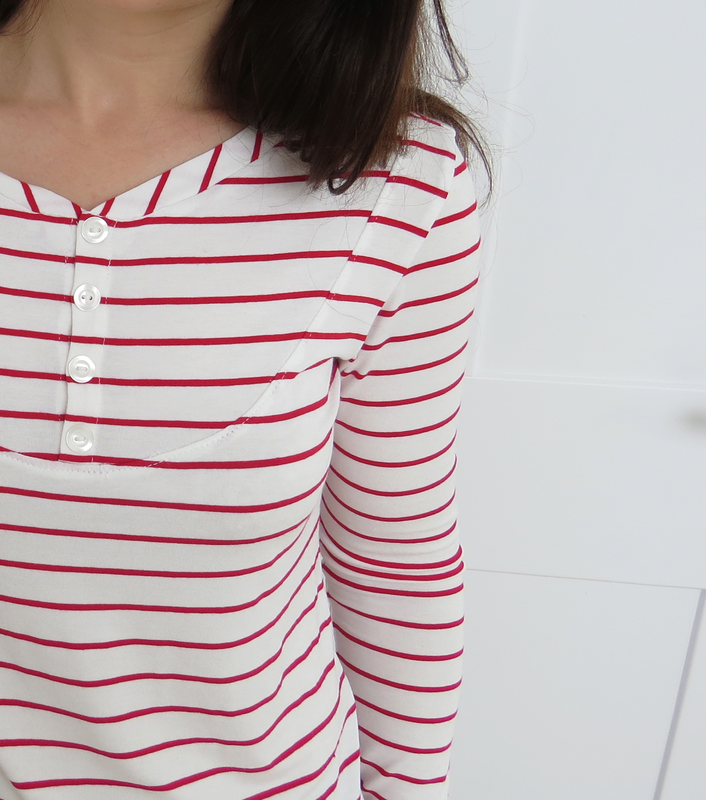 I made a really similar top to this one a few years ago, but have since lost the pattern pieces I drew up for it, so I set about re-drafting it, basing it again on one of my favourite tops that I bought about six years ago and which is so well-worn that it even has a hole darned up in one place! So here is my top. I am really, really pleased with it, which doesn't feel like an entirely humble or seemly thing to say, but if you could see the amount of ugly things I've made I think you'd forgive me. I love it not because it's brilliantly made (it isn't) or an amazing design (I really like it, but it's nothing special and it doesn't have a Peter Pan collar, which is what makes things really special! ), but because it fits really well (apart from at the neck, which could do with some refining, but which doesn't stop it from being wearable), it's really comfy, it was the first thing I reached for to put on when I went to get dressed this morning and because it has restored my enthusiasm for garment sewing, which I really do enjoy because I love clothes and I love the instant gratification of making them (compared to quilts…which can take me years, because when it comes to quilts I seem to like doing things slowly!). 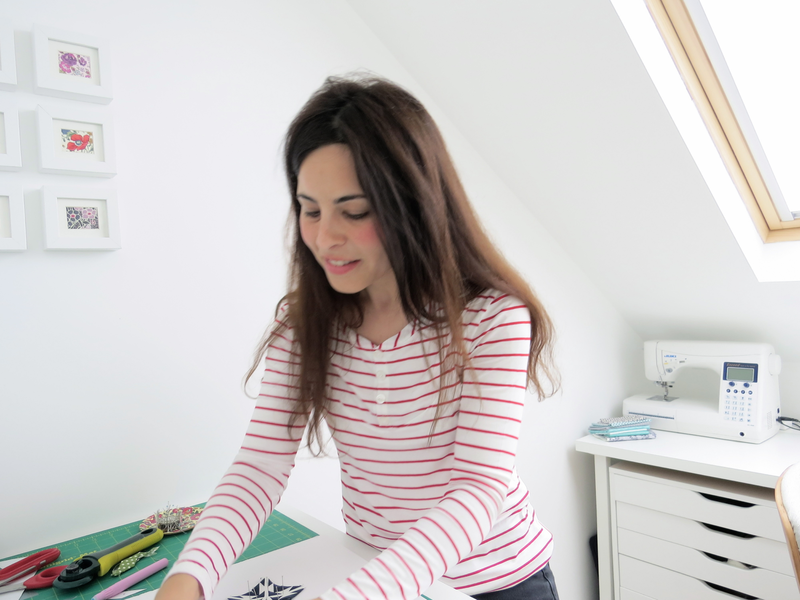 You can see in the photo above that I'm wearing my new top and am straight back to cutting some more pieces out for some English paper piecing, which I'm going to carry on doing really s l o w l y, but that's okay, because I'm wearing my speedily made Breton top (which is proof that I have two speeds), and because I can also say (in my head…I don't actually ever say it aloud) that I'm someone who makes clothes again…which I haven't said for a while, but is a really happy thought. It's almost worth making ugly clothes for the sense of having reached the top of the mountain when I finally make something wearable. Does everyone go through phases like this, or is it just me? Ps. I'm considering a second version in this Bari J knit fabric.